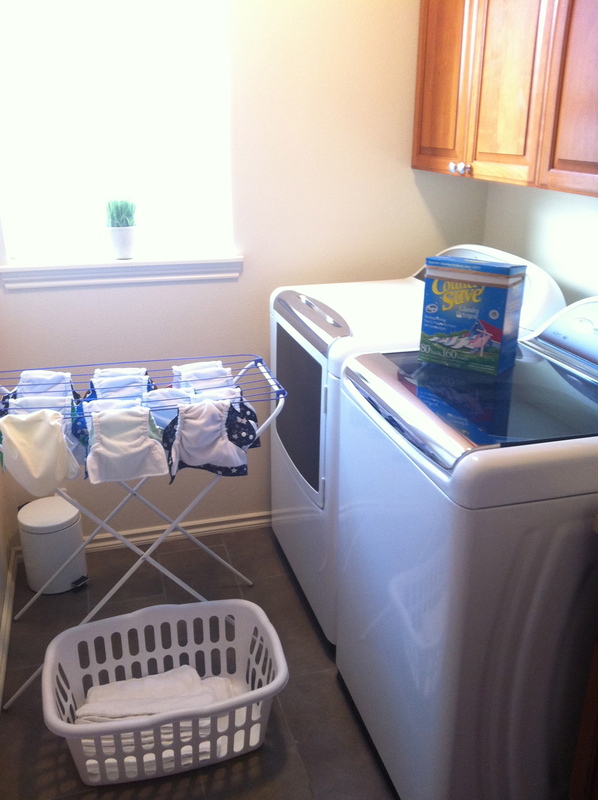 After some trial and error I think I figured out a wash routine for Kellan’s pocket diapers. Yay! 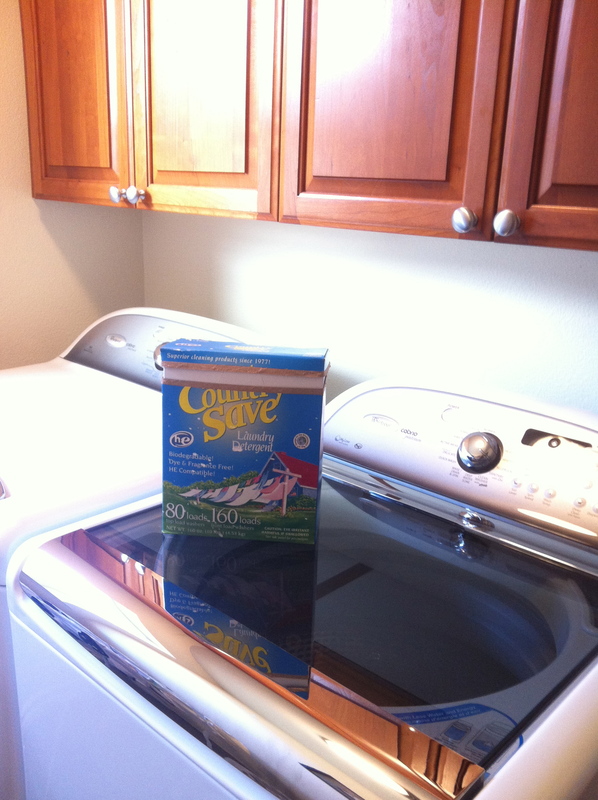 Originally I had been using Biokleen detergent (love the stuff and the clean smell), but it seemed to slightly irritate baby’s bum and I read it could potentially cause repelling issues with pocket dipes, so we switched to Country Save. You can get Country Save on Amazon in bulk, or if you want to try a smaller box first you can get it at any of these listed retailers on their site. I wash the diapers every other day. If I get a few more diapers I will switch to every 2 days (recommended time), but it hasn’t been to taxing on me and everything gets washed after Kellan goes to bed when we are relaxing with some TV time at night. Ok, so here’s the wash routine. Note, I have a top loading HE washer, the Whirlpool Cabrio Platinum, so this routine is geared towards a HE washer. 1. Delicate cycle with cold/cold and 1/4 scoop of powder Country Save. Some people place the powder directly on the diapers, but I put it into the dispenser so it mixes with the water. 3. Place the BumGenius and FuzziBunz pockets on the drying rack. Put the other pockets and the inserts in the dryer on low for 40 minutes. Usually I will take the covers out and hang the rest on the rack and keep the inserts in for another 30 minutes. This finishes while I am asleep. 4. In the morning I will them stuff the pockets and place any inserts with stains in the sun to bleach out. The sun is a natural bleach and after sunning for a few hours the stains are gone! Any stains I have are minimal as I spray the poopy diapers with a mixture of half Biokleen Bac-Out and half water before I put them in the pail. This product contains natural enzymes that take care of the stain and also disinfect. Bac-Out can be found online or at many natural stores. I even saw it at my local Safeway last week. Finally, now that Kellan is going to start solids soon (this weekend!). I’m going to have hubby install a diaper sprayer so I can spray off the poopy diapers before spraying them with Bac-Out. Up to this point Kellan’s been exclusively breastfed and BF poop doesn’t need to be sprayed as it easily rinses away in the wash. BF poop is also not stinky. It smells a little like buttered popcorn to me, but I heard that all changes once real food is added. Can’t wait (sarcasm). That’s it. It is a lot easier then I thought and Kellan’s bum is happy, plus we are saving money and the planet! This entry was tagged Bac-Out, Biokleen, Cloth Diapers, Country Save, Fluff, Laundry. Bookmark the permalink.